Manila, Philippines - The weather bureau PAGASA on Friday released special weather forecast, outlook for December 31, 2013 and the coming new year (January 1, 2014). According to PAGASA, Palawan, Eastern Luzon and Eastern Visayas will experience cloudy with light to moderate rains and thunderstorms while Metro Manila and the rest of the country will be partly cloudy to cloudy with isolated rainshowers or thunderstorms on New Year's Eve (December 31). On January 1, 2014, Eastern Luzon will continue to have cloudy skies with light to moderate rains and thunderstorms while Metro Manila and the rest of the country will be partly cloudy to cloudy with isolated rainshowers or thunderstorms. Moderate to strong northeasterly winds (Amihan) will continue to prevail over Luzon and Visayas and the coastal waters will be moderate to rough. Fishermen along the seaboards of Luzon are alerted against moderate to high waves generated by the strong northeasterly winds. The special released outlook will be updated as soon as significant changes in the weather occur, PAGSASA said. Tail-end of a cold front affecting Bicol Region. Northeast monsoon is affecting Northern and Central Luzon. Bicol region, Eastern Visayas and the provinces of Mindoro, Marinduque and Romblon will have cloudy skies with light to moderate rainshowers and thunderstorms. The regions of Cagayan Valley, Ilocos and Cordillera will experience cloudy skies with light rains. 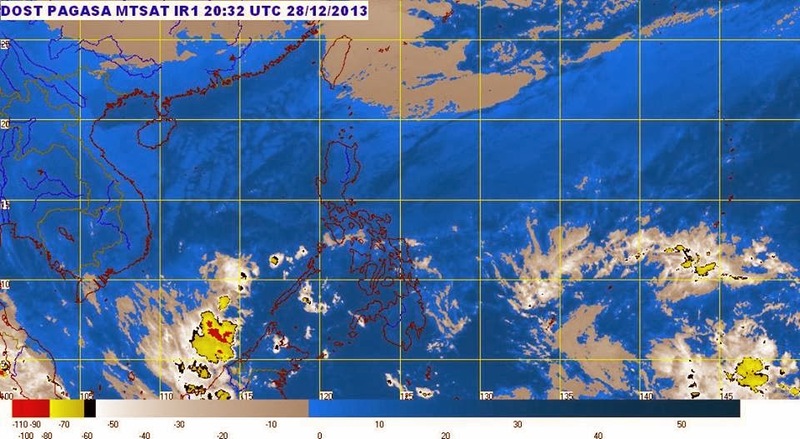 Metro Manila and the rest of Luzon will have partly cloudy to cloudy skies with light rains. The rest of the country will be partly cloudy to cloudy with isolated rainshowers or thunderstorms. Moderate to strong winds blowing from the northeast will prevail over Luzon and Visayas and the coastal waters along these areas will be moderate to rough. In Mindanao, winds will be light to moderate coming from the northeast with slight to moderate seas. For more information, please contact the forecaster-on-duty in the following telephone numbers: 927-2877/927-1541/926-4258.